Hungary's low cost airline Wizz Air plans to resume operations of the Ukrainian subsidiary – Wizz Air Ukraine – in 2019, the airline has reported. Wizz Air Ukraine has the goal of obtaining the license of the Ukrainian operator in 2019, the airline said. After a meeting of Ukrainian President Petro Poroshenko and Wizz Air CEO József Váradi the sides have achieved the accord regarding the fact that the resumption of operations of Wizz Air Ukraine would contribute the development of the Ukrainian aviation sector, offering fares for trips effective from the point of view of the expenses and quality ratio. Váradi said that in confirmation of the airline's commitment to Ukraine and in response to high consumer demand, Wizz is ready to significantly increase its investment in the country in the near future. In particular, this is the resumption of the operation of its Ukrainian subsidiary - Wizz Air Ukraine. Here the airline is counting on the necessary support from representatives of the Ukrainian government, he said. The airline plans to invest $2.5 billion to increase the Ukrainian fleet to 20 new Airbus A320 and Airbus A321 planes. "These aircraft will be delivered to the base of the airline in Kyiv and other regions of Ukraine. As a result, the planned volume of transported passengers will be 6 million per year by 2025," Wizz Air said. According to the management of the airline, the resumption of operations of Wizz Air Ukraine will create about 6,000 local jobs both in direct and related industries. It will stimulate a significant development of Ukrainian tourism and services. 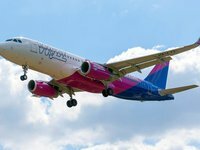 At the same time, the airline said that the resumption of flights of Wizz Air Ukraine will expand the network of its low-cost routes to/from Ukraine. Wizz Air closed its Ukrainian subsidiary Wizz Air Ukraine in 2015, continuing the service of flights from the country by the Hungarian airline. The top managers of the airline explained the decision to close the Ukrainian subsidiary by the unstable situation in the east of Ukraine and the devaluation of the hryvnia. Later, the airline several times announced the possibility of resuming its subsidiary after stabilization of the situation and in the event of an increase in demand for air transportation in the country. As reported, Irish low cost carrier Ryanair plans to open five new flights from Ukraine in 2019, and to invest $1.5 billion in Ukraine over three to five years, increasing the fleet to 15 aircraft and passenger traffic to 5 million people. Wizz Air offers flights on 41 routes to 12 countries from three Ukrainian cities - Kyiv, Lviv and Kharkiv.